Botanical name: Asclepias sppCommon names: Swamp milkweed, showy milkweed, Sullivant's milkweedUSDA zones: 3 to 9, depending on species (find your zone)Light requirement: Full sun to some shadeMature size: 2 feet wide and 3 to 4 feet tallBenefits and tolerances: Spicy vanilla scent; attracts many butterflies; all varieties are somewhat adaptable to soil moistureSeasonal interest: Plenty of midsummer blooms followed by autumn puffs of seedsWhen to plant: Spring to midfallCultivars of swamp milkweed include this white-blooming 'Ice Ballet'. The scent is irresistible to monarch butterflies and many other winged insects, like beetles, moths and flies. Monarch butterflies are probably one of the most visible summer butterflies — they’re hard to miss. In fall they migrate thousands of miles, from as far as southern Canada all the way to the oyamel forests in the mountains of central Mexico. These conifer woodlands protect the monarchs from most weather, and as the insects cluster together in massive dreadlocks of butterflies, they keep each other warm. In the winter of 2012 to 2013, monarchs occupied only about 3 acres in Mexico, and while that number represents millions of monarchs, it is also a record low. Get your garden ready for the butterflies. On New Girl, a monarch butterfly followed Prince around, even landing on his shoulder at his command. Make sure your garden is in top shape to welcome the monarchs. This is a larval host plant for monarch butterflies, and a large colony of this plant can provide an adequate supply of larval food for their caterpillars. Adult monarch butterflies regularly visit the flowers for nectar. 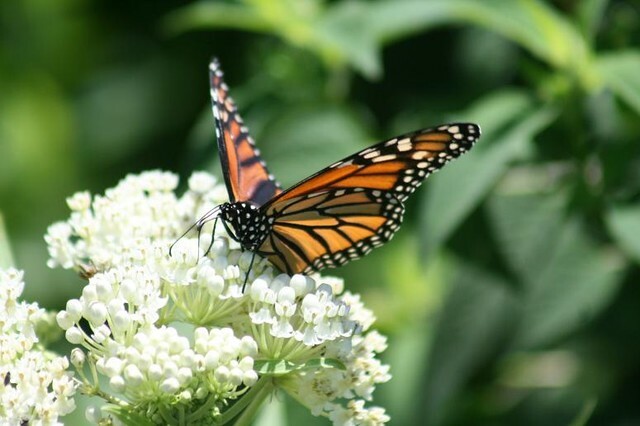 Monarch butterflies are pollinators that need milkweed (Asclepias spp.) to reproduce.In 2007 the U.S. Senate unanimously approved one week in June each year to be National Pollinator Week. This year, National Pollinator Week takes place from June 19 to 25. Spearheaded by the Pollinator Partnership — a nonprofit dedicated to promoting and protecting pollinators and their ecosystems — cities, businesses, churches, schools and environmental groups around the country will celebrate with all manner of events. This week is a time to come together to help pollinators who not only are critical to our food supply, but who also help the flowers in our gardens, prairies, forests and deserts reproduce and thrive. Love monarchs. Have many milkweed plants for them. Inviting birds, frogs, etc to yard.